Jean Livingston Hood was born on January 4, 1923, in Wayne County, North Carolina. 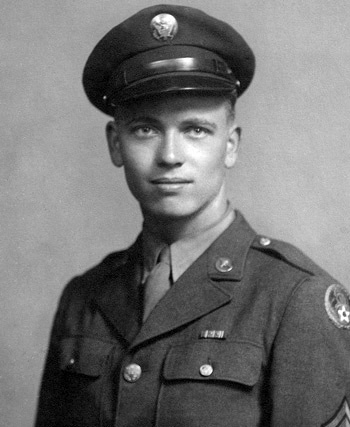 He enlisted in the U.S. Army on January 30, 1943, and joined the U.S. Army Air Forces on May 15, 1943. Hood attended the Engineering and Operations Clerical Course at Army Air Forces Training Detachment, Colorado State College of Agriculture and Mechanical Arts, and then joined the 328th Fighter Squadron of the 352nd Fighter Group at Westover Field, Massachusetts, in June 1943. He deployed with the group to Bodney, England, in July 1943, and served as an Air Operations Specialist with this unit until November 7, 1945, when he returned to the U.S. and received an honorable discharge from the Army Air Forces, effective November 12, 1945. Jean then returned to North Carolina, where he worked in the Dairy Industry until becoming a Methodist Minister in 1958. He served as the Chaplain for the 352nd Fighter Group Association at all of their reunions through 2008.